Spot Opportunities (Commercial Blog): September Steals on Kidde ! 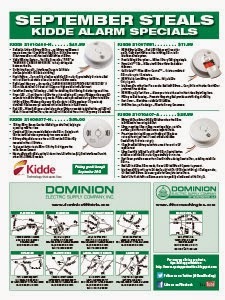 Good News - Great pricing on select Kidde items will be extended through OCTOBER!  - Large mounting base makes mounting easier, protects surface paint from dirt and covers imperfections. -  Large centrally located Test/Hush® alarm control button silences nuisance alarms for approximately 9 minutes. -  Dust cover protects sensor from contaminates during construction, reducing nuisance alarms. - Interconnectable with up to 24 devices (of which 18 can be initiating) including smoke, CO and heat alarms.